GoodSoundClub - Romy the Cat's Audio Site - Romy stalked me on the family vacation! Most of you know that I built Romy's horns for him. The one thing that you may not know is Romy recently requested additional horns from me. He wanted some 250Hz tractrix horns made for an upper-midrange Vitavox S2 compression driver. Being very limited on time, and still working on another fellow’s horns, I had to decline his request. The interesting part of this story began two weeks after the conversation with Romy. Collapsing under the pressure of the wife and kids, I regrettably agreed to a Disney World vacation (A.K.A the world’s worst tourist trap). Additionally, I just about soiled myself when we checked out how much airfare was going to be. The solution, gas up the Honda and save about $1500 in airfare. Thank God for in-car DVD players. I’m almost certain I would have returned childless after a long penitentiary stay if it were not for the DVD player. Anyway, the whole time we were in Florida I had this weird feeling like I was being watched. I would catch the glimpse of a shadow here and there. I thought to myself, no it’s just my imagination. There can’t be anyone following us. However, my fears were confirmed on our drive back home. At first I wasn’t sure, but after an intense game of Cat and Mouse we were able to snap some spy photos of our own. Romy must have had too much Cat Nip and Red Bull, because his one slip-up blew his cover. Or was this just part of his plan? Before I realized he had charged me from behind, just like a Cat pounces on it prey. It happened so quickly we were not able to get a picture of the front of his van. However, I can tell you the fearsome glare of the red cat eyes painted on the hood was terrifying! I quickly changed lanes and allowed him to pass. In a frantic attempt to record what could have been our very last images, we snapped a rear shot of Romy’s van. 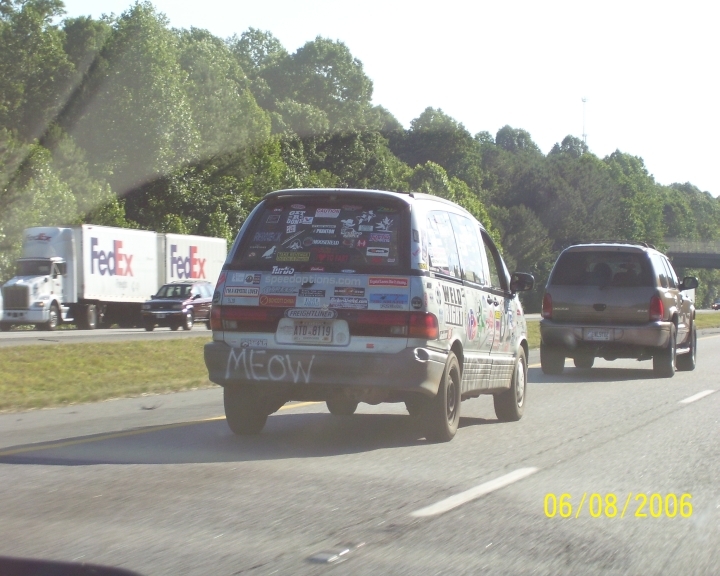 As soon as I saw the “Meow” written on the bumper, I knew it was no other than the Cat himself! Appearing to be quite entertained by his skillful ambush, he chose to exit the highway. 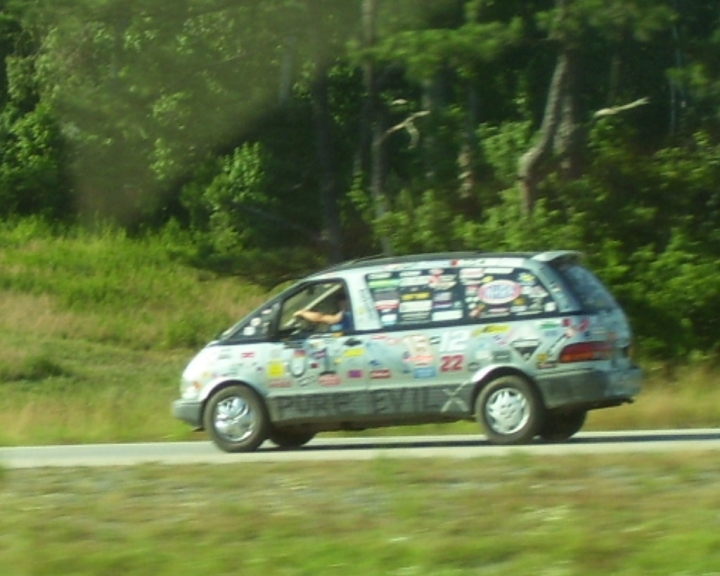 We snapped a side shot of the van, and then he vanished as fast as he appeared. It was like watching the morning mist dissipate without a trace. As you can see from the side shot, Romy makes no bones about his attitude about Moron drivers. He seems to treat audio Morons and driver Morons all the same. Romy gives everyone a clear warning, as the driver’s side bottom trim reads “Pure Evil” and the passenger side bottom trim reads “Not a Taxi”. In other words, watch yourself because you have no idea whom you are dealing with, and there will be no free rides on Me.